Description: This plant can appear as a large, low-growing fern with a creeping rhizome or as a tree fern with an upright, trunk-like rhizome. The trunks typically have a skirt of drooping, silvery gray dead leaves. The lower leaf stalks are surrounded by brown, hairlike scales. 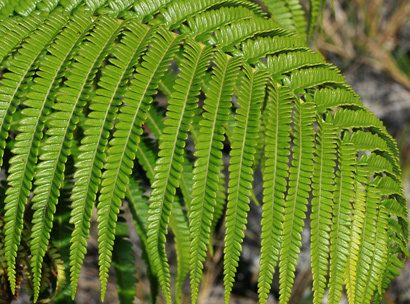 The large, gracefully arching fronds are pinnately compound with leathery, narrowly oval-shaped pinnae that are shiny green above and greenish white below. The new leaves are a distinctive flame-like red to orange color. Fertile fronds have dark brown sori on the undersides of their pinnae, while sterile fronds do not. The sori line either side of the single, prominent midvein for most of the length of the pinna. 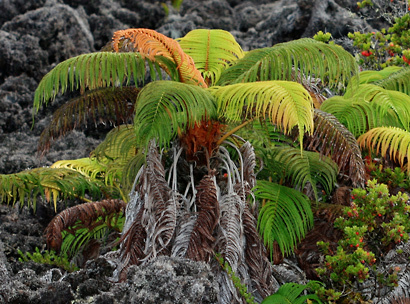 This fern grows in moist forests and colonizes upland lava flows. Edible – The young leaves and the starchy core of the trunk (a traditional Hawaiian famine food) are edible if cooked.